Sometimes life gives you many surprise…Many years ago when I first started looking for a job in Washington DC, one of my dream jobs was to work for an international organization. For three years I worked at the Pan American Health in Washington DC. I left it for good to dedicate myself full time to my jewelry business. Although I miss my good friends, and all the latin flavor that comes with it:) The cafeteria with international food and speaking Spanish 70% of the time as if I were in Peru. Few weeks ago I received a phone call from one of the event coordinators of the International Monetary Fund, asking me if I could work demonstrating how I hand-craft my jewelry pieces. 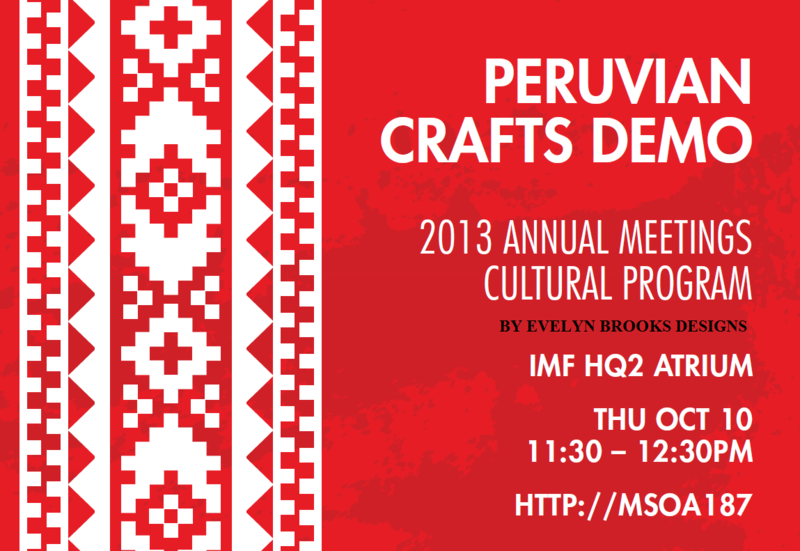 The event would be call Peruvian Craft Demo by Evelyn Brooks. The purpose was to promote Peru during different presentations with traditional dances like Marinera, gourmet Peruvian food and Evelyn Brooks Designs with her jewelry designs made with the traditional huayruros. I prepared my proposal and send it as requested. Once approved I started to prepare everything making sure it would be a wonderful presentation. This would be a very special exhibition; because I was going back to the world of the International Organizations in Washington DC, but this time I was hired to perform what I love to do and present my jewelry line (kind of like a dream come true). I left this world to pursue and take one of the biggest risks in my life, to launch officially my own company, become an entrepreneur and a few years later become a mompreneur. Coming back was a way of showing that I left for good;) THANK GOD! Two of the top most recognized newspapers Peru 21 & Diario “La Republica” in Lima-Peru came to interview and learn about what Evelyn Brooks, a Peruvian who left Peru almost 10 years ago, had decided to continue her career and make a new life in the United States.